If you’re interested in creating a personal or a business website, you can use Drupal. Drupal is an open source content management framework used by thousand of enterprises, governments, higher-education institutions and NGOs for creating their websites with reliably and flexibly. NGINX is an open source web server that helps developers to improve the security, performance and reliability of their applications. And not only that, it can also function as a proxy server for email (IMAP, POP3, and SMTP) and a reverse proxy and load balancer for HTTP, TCP, and UDP servers. This guide walks you through the process of installing Drupal on top of a running NGINX server. That way, you will simplify, for example, the configuration of Let’s Encrypt certificates to secure your Drupal website. You have a basic understanding of NGINX. You have a Bitnami stack installed with an Nginx server - for example, the Bitnami Nginx Stack. Copy the demo/ directory from the /opt/bitnami/docs directory to the apps directory, and remove the htdocs/ directory from the demo application. Download the latest version of Drupal (replace the X.Y.Z placeholder with the latest version available) and extract the files into the /opt/bitnami/apps/drupal/ directory, then rename that directory to /opt/bitnami/apps/drupal/htdocs/. Create a database for Drupal (you need to indicate the MySQL credentials). 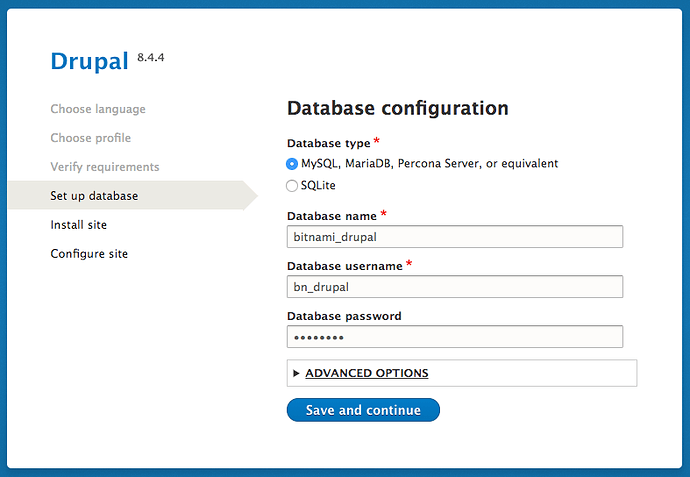 Create a database user for Drupal (you need to indicate the MySQL credentials). 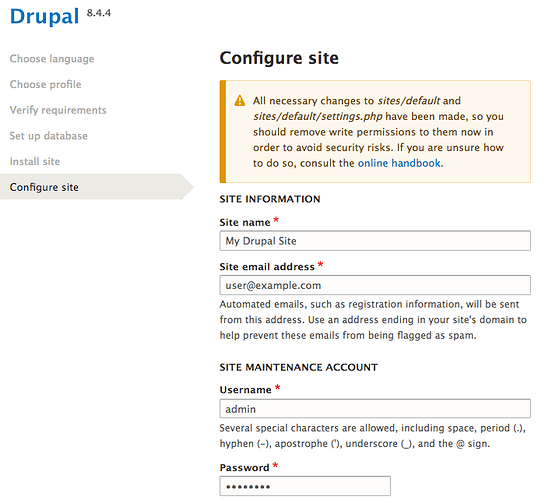 NOTE: Replace the DRUPAL-PASSWORD placeholder with a user-defined password that you will use when installing Drupal. In this step, you will perform some changes in the NGINX configuration files in order to make the application work at the root URL of the NGINX server. Follow the instructions below to finish the Drupal installation. Now, your Drupal installation should be running at the root URL of your NGINX Web server!